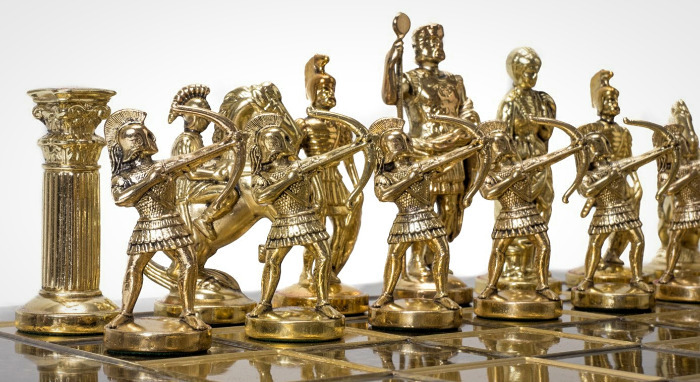 Find the best chess sets made of metal, pewter, silver or even 24 karat gold using this guide. Pewter is a classic choice of metal for chess sets, and its use dates back to the Civil War era and before. Pewter chess set pieces have a good weight to them and usually do not require additional weighting to give them a pleasant feel in the hand. Pewter is often paired with brass to make a full set – with the pewter pieces representing Black’s army and the brass finished chess set pieces fighting for White. Bronze is another popular material used to make metal chess sets. This metal gives the pieces a luxurious, shiny finish that makes each piece look like a sculpted statue. In fact, some Bronze chess sets even forgo the standard Staunton pattern, instead favoring pieces that are modelled after people. Gold and silver are typically used as a plating on chess pieces formed of a less expensive and more durable metal. Solid gold chess sets do exist, though they’re more often used as a decorative object and a status symbol than an actual playable set. Gold and silver plated chess sets can offer a touch of luxury to your game while still holding up to the rigors of frequent use. Those are just some of the materials that may be used to form a nice metal chess set. This gorgeous chess set is made in a style that you don’t see every day. It has all the recognizability of the traditional Staunton pattern, but with an undeniable spin that makes it entirely unique. 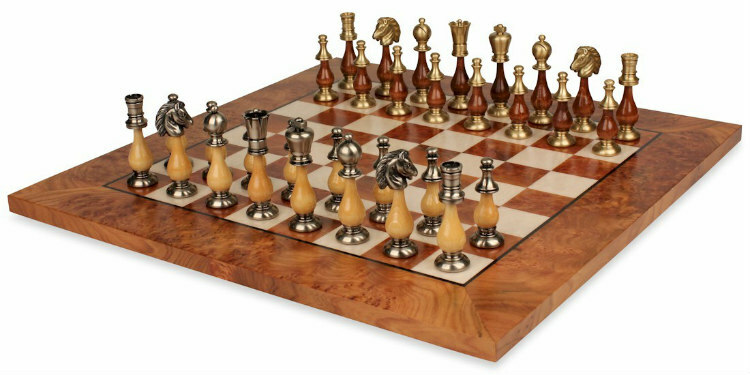 The Grande Persian Staunton Brass & Wood Chess Set with Elm Root Board also combines the two elements of metal and wood in a beutiful way that many designers would not think to try. 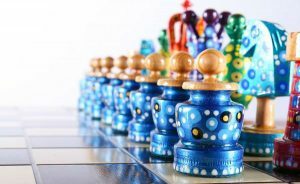 The result is a totally unique, beautiful, and high quality chess set that would be perfect for a buyer who loves both metal chess sets and traditional design. 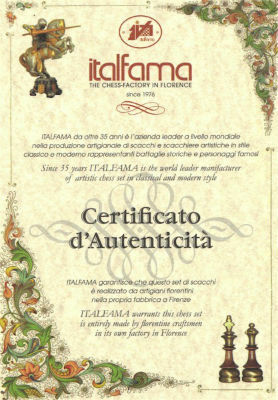 The chess pieces in this set are made in the prestigious Italfama factory and come packaged in their signature decorative box. Each piece is made from Brass, wood, and Nickel plated steel, and the King pieces stand 3.875 inches tall on a 1.125 inch diameter base. They exude luxury and add interest to any room. Don’t be surprised if they catch the eye of every visitor you have in your home or office! 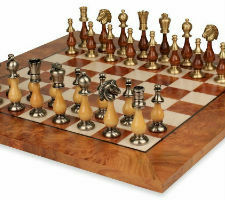 The chess board is made from Elm Root and Maple veneers, along with other wood material. It is finished with a high gloss polyurethane that gives the board an extremely shiny, almost glass like look. 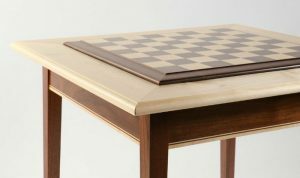 The dimensions of the full chess board are 20.5″ x 20.5″ x .625″ and it features spacious 1.875 inch squares. One look at this chess set and it’s plain to see why it’s such a popular product. In fact, this chess set is a bestseller! Plenty of other people are going to be wanting to get their hands on this chess set, so if you want one for yourself, don’t wait. Good luck! When they described this set as “large,” they were not joking. This metal chess set features gigantic chess pieces that tower above the board. The effect of seeing them all lined up around the 5 and a half inch tall King pieces is nothing short of impressive. The chess pieces included in this heavy metal chess set are modelled after European monarchs from the 12th to 17th centuries. So, those giant King pieces are actually modeled after real Kings! All of the pieces represent an aspect of the Renaissance culture that pervaded Europe between the middle ages and modern history. All of the pieces are tall and thin, stretching upward toward the sky, seemingly in an attempt to intimidate the armies of the opposing side. Just looking at these pieces arranged on the battlefield, one can feel the tension between the two sides, and that just might compel you to sit down for a quick game or two! 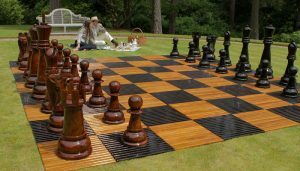 The board that these larger than life pieces have chosen as their battlefield is a grey briarwood chessboard with a smooth, glossy finish. The pale grey of the board’s darker squares contrasts nicely with the resplendent gold and silver finishes of the chessmen above. 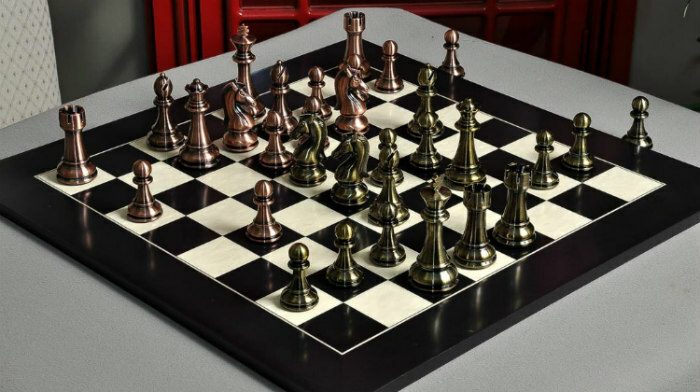 Its modern style will fit in with any type of decor, and it doesn’t compete for attention with the chess pieces which are the main focus of The Large Metal Renaissance Chess Set. The two components complement each other, with neither trying to steal the show from the other. This is a highly unique metal chess set that has been gaining popularity over the years. 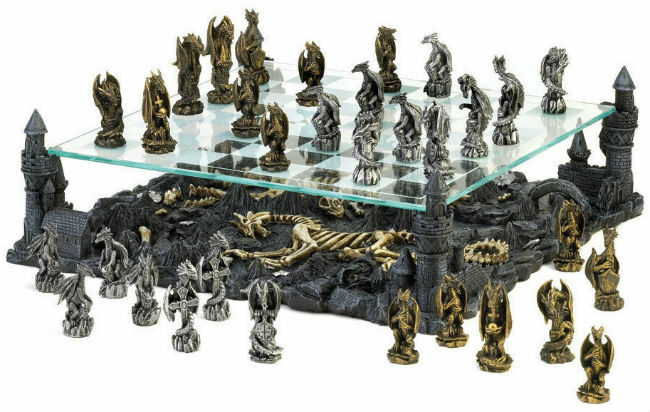 With the rise in popularity of the TV show Game of Thrones, more and more people have become interested in dragons, and this metal chess set caters to that interest. One look at The 3D Dragon Chess Set and you’ll be able to see why it’s quickly becoming a favorite in the chess community. The chessmen in this set are not modelled after humans or horses or any other familiar shape – they’re all dragons, of course! Each piece is extremely detailed with different poses, postures, and expressions for each dragon. Now that’s impressive! The pieces are made of solid metal with grey and gold finishes. Any chess player with a good imagination will have a blast playing games with these scheming mythical creatures under their command. Rather than capturing opponent’s pieces, they may prefer to fry them to a crisp with their fiery dragon breath! Every match played with this metal dragon set tells a story, that’s for sure. The dragons are supported by a floating glass chessboard that’s suspended above the charred remains of an ancient battlefield where dragon bones still lie. The turrets of blackened castles form the foundation for the dragon battles above. 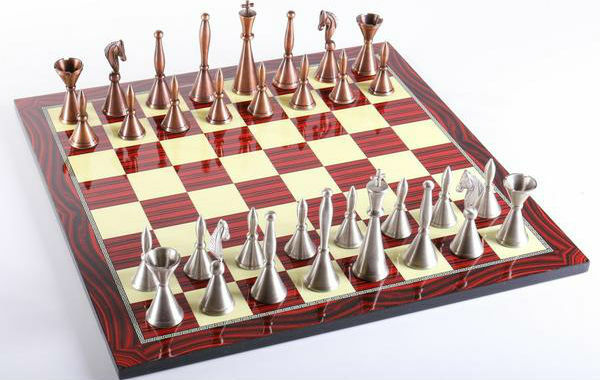 The board is one of the coolest features of this metal chess set, and it is definitely eye catching, to say the least. 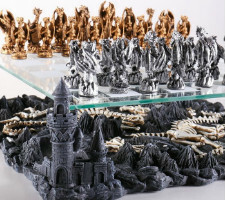 This 3D Metal Chess Set is a must have piece for collectors and dragon lovers alike. It makes a great everyday chess set, as well as a cool decoration for your room whenever it’s not in use. You’re guaranteed to get second looks, questions, and compliments from your friends when you have this impressive set on display in your home! 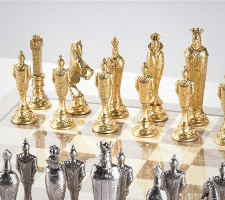 This metal chess set is the ultimate in luxury. Anyone looking for the best brass chess set out there can stop their search right now. The Candidates Series Chess Set is a large and weighty set with a 4.25 inch tall King that requires a board with at least 2.375 inch squares to accommodate it appropriately. As you would expect from a House of Staunton product, this is an extremely high quality metal chess set made from the finest materials in the Staunton style. The chess pieces in the Candidates Series Chess Set are undoubtedly the centerpiece of the collection. They are simply stunning. They are WoodTek resin pieces that have been finished with electroplated copper and brass finishes. They are naturally well balanced and weighted, with luxurious leather base pads on each piece. No detail was overlooked on this set of top tier chess pieces. The end result is a striking set of metal chess pieces, one army brass in color and the other a soft copper, with almost a rose gold type of look to them. They have a subtle brushed look to their finish and gleam in the light as only perfectly polished metal can. This set of gorgeous metal chess pieces is available for sale on its own or with the buyer’s choice of chess board and chess box. We recommend buying everything all at once, because that way you get a discount on both the chessboard and the chess box, no matter which style you choose. 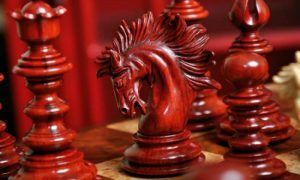 These chess pieces are available at such a low price that you actually may end up saving money over some of the other complete chess sets on that House of Staunton site, and you’ll still end up with an amazing luxury chess set of the highest quality. That’s what we’d call a win-win! This modern brass chess set offers one of the best value for money deals available in 2019. Its sleek, modern design sets it apart from other metal chess sets and gives it a feeling of luxury, with a less than luxurious price tag! The chess pieces that come with this brass chess set have a sleek and modern design that make any office or living room look more elegant. The pieces are taller and thinner than common chess pieces, but they still maintain enough of the classic designs that they’re easily recognizable. Any chess player would be able to pick up The Brass Art Deco Men Chess Set and play a match without too much difficulty, unlike with some sets where the pieces are virtually unrecognizable. The King piece is 4 inches tall, but still fits comfortably within the 1 ⅞ inch squares of the included chess board. The chess board for this brass chess set is highly unique as well. It is actually made using a French technique called decoupage, which consists of cutting out images and pasting them to an object, then applying several coats of lacquer. That’s exactly how this chess board was made, though you’d never know it just by looking at it. One of the best value for money deals available. 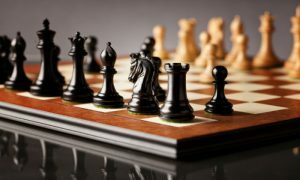 The chess board started out as a plain, 18 ¼ inch square piece of wood, and then a piece of paper with the design of the chessboard was glued to it and several coats of lacquer were applied to protect the paper and give the board a smooth, shiny finish. 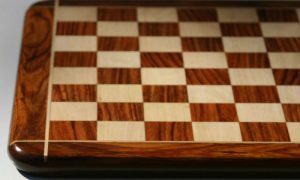 The finishing process gives the board the illusion of depth, and the casual observer would never be able to tell that the chessboard was made from a sheet of paper rather than meticulously inlaid wood. This is how they can offer such an elegant looking brass chess set at such an inexpensive price. Yes, these heavy chess sets are all made of metal, but if there is a specific type of metal you’d prefer to have, or a certain finish that you want, make sure to consider that in your final decision. 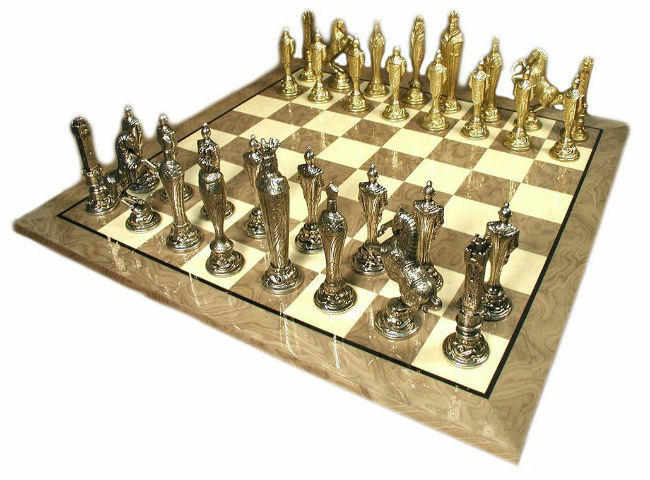 Do you need to have a metal chess set that’s plated with 24 karat gold and silver, or one that just looks like it is? The choice is yours. Some of the metal chess sets on this list are very large, with tall pieces that tower above the board. Is that ok with you, and do you have space for such a board? Or would you prefer something more compact, with squat pieces that you can easily store away? Consider the place where you’d like to put your metal chess set and how much room you have available there. You may want to take some measurements before you make your final decision. Finally, don’t forget about the price tag. Some of these metal & pewter chess sets are so unique and gorgeous that it’s easy to get carried away. Make sure you take a step back before buying and consider whether you can really afford it and if you’re comfortable spending that much on a gold chess set. Yes, a good investment will get you a good chess set, but there are some good deals available out there as well. Buy Online: The Best Metal & Pewter Chess Sets – Shipping Worldwide. 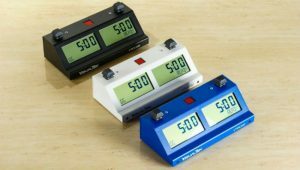 Chess Sets Reviews: Our Reviews List of the Best Chess Sets on the Market. Chess Shots: Shot Glass Chess Set – Your New Favorite Drinking Game!